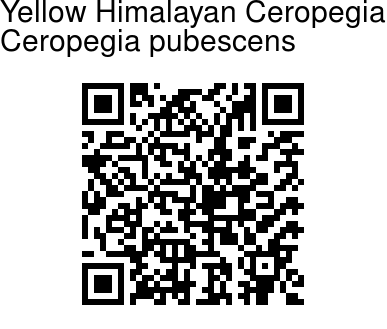 Yellow Himalayan Ceropegia is a herbaceous, twiner, up to 1 m long. 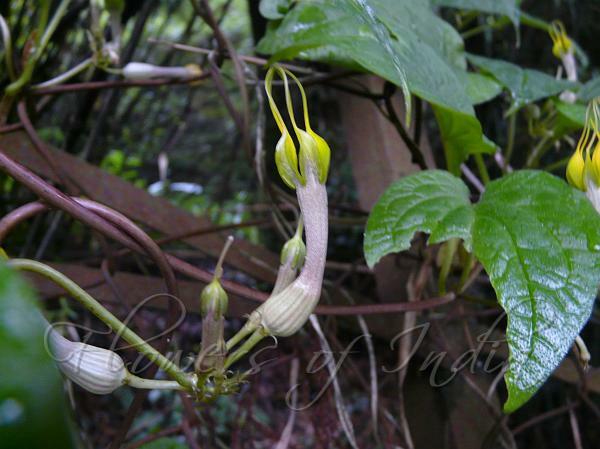 Flowers are yellow, 5-5.5 cm - tube 3-3.5 cm, base slightly inflated, throat 3-5 mm in diameter, narrower than base. Petals are linear, 2-2.5 cm, basal about 1 cm orange-yellow, wider and strongly revolute, tip part purple. Inner lobes linear, much longer. Leaf-stalks are 3-4.5 cm, hairy. Leaves ovate or rarely oblong, 4-15 × 1-6 cm, membranous, adaxially villous, base rounded, tip long pointed. Lateral veins are abouit 5 pairs. Inflorescences are shorter than leaves, about 8-flowered, carried on a stalk about 2.5 cm long. Flower stalks are about 1 cm, puberulent. Sepals lanceshaped, about 1.5 × 0.5 cm. Follicles are narrowly fusiform, about 13 cm × 2 mm. Flowering: June-September.